This Monthly Round up and Favourites December 2017 is coming a little later than usual, but better late than never, right? Once again, the month was busy and went by way too fast. But, boy, was it fun! There was lots of fun get togethers, tons of good food and plenty of relaxation. What more could I want? Before we head into January, let’s take a look at how December looked for me. Be sure to leave your favourites from December in the comments below. I’d love to hear! No Bake Peppermint Chocolate Snack Bites -10 minutes to make and perfect for a hostess gift! Fuss-Free Vegan Book Review Plus Lettuce Wraps – There’s over 100 recipes in this vegan comfort food book. It’s an awesome book for vegans and even those that love the occasional burger. For my review, I shared a lettuce wrap recipe from the book. It’s lentil based and is absolutely delicious! Orange Poppy Seed Shortbread Cookies – Shortbread are my favourite cookies. These are dipped in orange chocolate and sprinkled generously with pistachios. Homemade Food Gifts for the Holidays – Homemade gifts are the best! This round up provides lots of inspiration. It’s great to have on hand not just for the holidays. Lots of these would be awesome for hostess gifts too! Meat and Cheese Board – This is one delicious board for parties, but also for a random Friday or Saturday night for an easy dinner. Hubby and I enjoy these on the regular! Fruit Cake Bread Pudding – Leftover bread pudding? 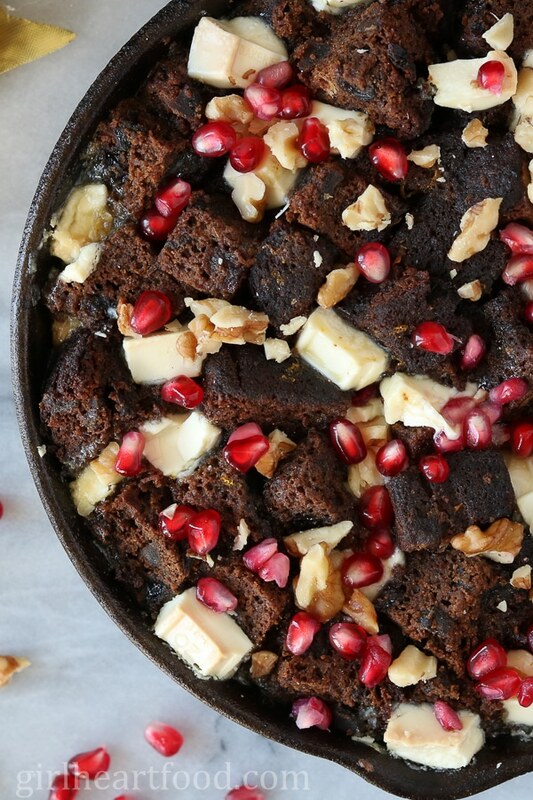 Jazz it up with these delicious (and easy) bread pudding with white chocolate and pomegranate. New Year’s Eve Recipes – Cocktails, little bites and more in this yummy round up. Top 10 Recipes of 2017 – These are the top ten recipes that you guys have been loving this past year. #1 on the list is a recipe from 2015 that still remains popular today – my traditional Newfoundland Cod-au-Gratin! Homemade Coconut Cream Pie from Ciao Chow Bambina – if you know me, you know I loves me some coconut…coconut in food and coconut scented things. This family recipe from my friend, Annie, is screaming my name! Of course I watched all of my favourite Christmas movies this month! Top of the list – Christmas Vacation. That one never gets old. Big Bang Theory is usually running a marathon on the Comedy Network over Christmas so that one was pretty much on everyday in our home. Do you love that show like me? And all those neat novelty t’s that the character, Sheldon, wears? Love them!! 32 Yolks by Eric Ripert. I mentioned this book before, but finally finished it. He is a chef and the book is his story from a child to where he is today. It’s entertaining, funny and a fast read. I really enjoyed this one. I’m obsessed with candles, especially festive ones around the holidays. Are you a scent fanatic like me? Isn’t it the cutest?! On it, it says ‘Little helper in the kitchen.’ I highly doubt that I’m ever going to use this one while actually cooking because I wouldn’t want to get anything on it, lol. Girl Heart Food had a feature in HarrowSmith – Favourite Cookbooks, Kitchen Tips and Last Minute Holiday Ideas. So exciting! In December, I also found out Girl Heart Food made Plik Top List 2017 – 25 Canadian Influencers to Discover! Hope you’ve enjoyed my Monthly Round-up and Favourites December 2017! What did you do over the holidays? Any good eats? Do tell! If you missed my last monthly favourites, you can check it out here. P.S. Stay tuned to next week! I have a really yummy recipe for you guys! That cookbook sounds awesome- I love all things lentil! And I like how your dog thinks- warm towels are the best lol! Those No Bake Peppermint Chocolate Snack Bites sound like the perfect wintery treat! Thanks Jolina! It truly was an awesome year 🙂 Friends is pretty awesome too and glad to hear you had a food filled holiday…always the best 😉 Have a fabulous 2018, my friend! Love the roundup! I only did a little baking over the holidays myself, but I did come up with a new shortbread recipe, which is ALWAYS something I love doing. Hopefully it can hold a candle to your orange and poppyseed shortbread, which not only look AMAZING, but sound like an absolutely phenomenal combination. I did make some other homemade presents (as you say, homemade stuff is the best for gifting!). Your round-up reminds me to look through my copy of Fuss-Free Vegan too. I ended up with so many new cookbooks this winter that I’ve got a stockpile to work through. Ah, first-world problems. That sounds great! Shortbreads are my favourite! I’m sure they are awesome, Sean 🙂 Have fun looking through your new books..I can browse through them for hours! What a great month! I clicked on your Harrowsmith link and just above you is my old Chef/Italian Culinary Teacher, Dario Tomaselli! What a small world. I also got the Jamie’s Christmas book and am loving it. Good recommendation! It is a small world!! Thanks Leslie-Anne! Such a great book 🙂 Have a great week! December was such a fabulous month and I have to admit that I don’t feel that I have fully arrived in the new year yet. When you don’t know what day it is you know that you have truly let go 🙂 December was filled with good food, friend and family and I am already looking forward to Christmas next year 😉 Love the Big Bang theory, never fails to make me laugh and how cute is your apron – what a fantastic present. Looking forward to all your delicious recipes in 2018! Happy New Year! You had quite a December, Dawn! And your new Fur Baby apron is swoon worthy! Happy, Happy New Year, my sweet friend! Looks like you had another wonderful month! Loving those peppermint snack bites! And that apron…SO cute! Love seeing pictures of your fur baby! Hope you had a happy new year and are having a great first week of January! I definitely did 🙂 Thank you, Gayle! Cheers to a lovely January and new year!! Happy New Year Dawn! So glad you had an enjoyable and restful holiday! Loving your monthly roundups. Your homemade holiday gifts roundup was great, but I think my fave recipe for the month was your fruit cake bread pudding. Love dark fruit cake and that recipe sounds so unique and delicious! Looking forward to your new recipe next week! Same to you, Leanne! We sure did!! Thank you so much! Gotta love that fruit cake, right 😉 Have a wonderful weekend! What a sweet gift from your puppy! Now you are bound to make more good food:) Great about all the recognition you are rounding up, congrats! Stay warm and have a wonderful weekend! Haha – I think so 😉 Thanks Milena! Have a great weekend too! Where in the world did December go!? It seriously was a whirlwind, but it was super fun. Now I’m sitting here wishing I could go back to wearing footy pajamas and watching tv all day! 🙂 I love that apron! We have 2 pups that love to help in the kitchen, too…oh, and they love a pile of warm laundry. It kinda makes me want to try curling up in a pile of warm laundry to see what it’s like! Happy 2018, Dawn! Right?! Yay for footy pjs 😉 ! Thanks David! Happy 2018 to you too!! Happy New Year! I always wonder how the months go so quickly and this entire year seems to have just flown by! I can’t wait to see what the new year brings! Congratulations on making the Plik Top 10 List! That’s wonderful! I loooove Eric Ripert (when he’s on Top Chef I go crazy) but I didn’t know he has a book out. I’ll have to pick it up ASAP! LOVE your new apron. I think I’d just wear it around the house, not use it when I’m cooking because I’d be afraid to stain it :). Have a great weekend, Dawn! So glad you enjoyed the holidays Dawn! Loving this yummy list of recipes! And the adorable pics of your little helper in the kitchen! Looks like you’ve tired him out! Can’t wait to see what you’ll be serving up in 2018! Thanks Mary Ann! I sure did 🙂 Happy New Year!